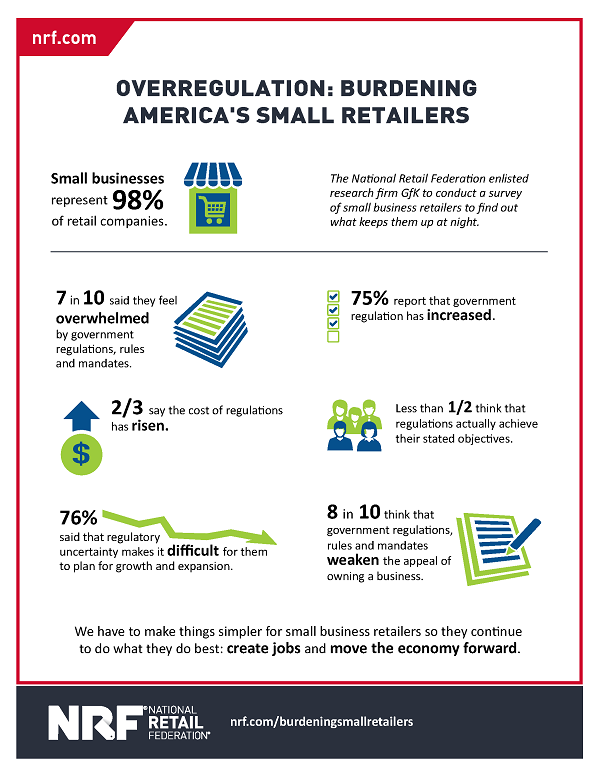 Small businesses in the U.S. say they’re drowning in government regulation, with 69 percent of them saying they feel “overwhelmed” by regulations, rules and mandates, according to a new survey from the National Retail Federation. The findings are based on surveys of 652 small business owners conducted between December 2015 and January 2016. The survey found that 81 percent of small business owners said regulations “weaken the appeal of owning a business,” with only 44 percent of respondents saying that government regulations help businesses achieve their objectives. As well, 75 percent of respondents said that government regulation is increasing; 76 percent said that regulatory uncertainly makes growth and expansion more difficult.